Cats sure are great companions to have in your home. They love to play, the kill pests, and they make for good friends too. With that being said, indoor cats do come with a big problem, which is the litter box. Yes, they go to the bathroom indoors, in litter boxes. The problem is that litter boxes are often not built very well, and cause horrible smells, plus they often result in the litter and cat waste being tracked throughout the home. Appealing it is definitely not. However, this is where the Modkat Litter Box comes in very handy. It’s a good cat litter box to effectively contain your cat’s mess. The Modkat Litter Box is a fairly new and modern type of litter box, one that comes with a top entry system for cats. Now, this is not the cheapest litter box around, but it is an effective way to contain that mess. Also, most litter boxes can be fairly hard to clean, but thanks to the convenient liner which this litter box comes with, it is fairly easy to clean, plus the liner is reusable as well. 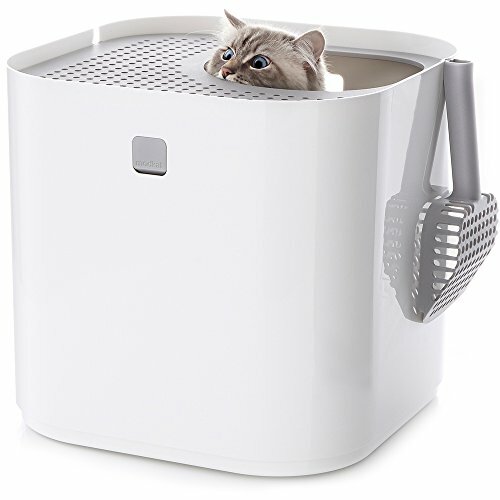 It’s a swivel lid kitty litter box for easy access and for easy cleaning, and it will help to keep your home a lot cleaner than it would be otherwise. All things considered, for what you get here, and for the benefits which the Modkat Litter Box brings to the table, it’s an investment worth making. If you have an indoor cat, the Modkat Litter Box is great for you. No, it’s probably not necessary to have if you have an outdoor cat, but for the majority of people who have indoor cats, this is definitely a useful item. Simply put, cats make messes. They tend to track litter around the home, which is stinky and dirty. Litter boxes also tend to be fairly hard to clean, at least normal ones are, which this one is not. So, if you want an easy-to-clean and mess-stopping litter box for your cat, the Modkat Litter Box is worth looking into. When you buy the Modkat Litter Box, you get the litter box itself, which is a vertical-entry litter box. Moreover, it comes with reusable plastic liners. These liners are moisture proof and very resistant to ripping. Moisture won’t seep through the liner, and your cat should not be able to scratch holes through it either. It’s an effective and easy-to-clean liner that can last up to 3 months, but once 3 months is up, you will probably need to buy a new one. For one, the Modkat Litter Box is a fairly large litter box, one which your cat can easily fit into, plus it can hold a fair amount of litter. The box itself features a seamless design so no waste and moisture can seep through any cracks. The plastic itself is quite tough, and it itself is designed to be easy to clean. This is a vertical entry box, one with a swiveling lid. Now, the lid has a hole in it big enough for your cat to climb into and out of with ease. The swiveling aspect is actually for you, because it makes the Modkat Litter Box easy to clean and empty. 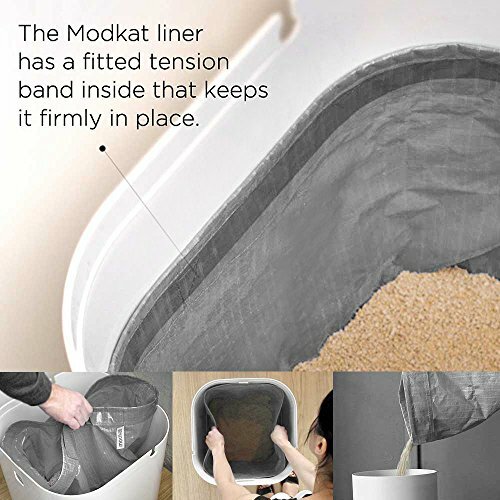 The Modkat Litter Box features special reusable plastic liner bags. These bags are made to be very thick so that they don’t rip if you cat claws at them. They are also made thick so that there is no chance of anything ever leaking out of them. What is nice is that these bags last for up to 3 months, depending on how many cats you have. They are slick and very easy to clean with some soap and hot water. Other than that, the Modkat Litter Box does not have any other features. It might be a very simple and straightforward item, but it is definitely very effective at performing its intended job. The Modkat Litter Box is very simple to use. It’s a cat litter box with a swivel lid. Simply insert the included litter box liner which is tailored to fit the shape of the inside of the box. Once your cat has used the litter a few times, simply pick up the liner and pour the contents into the trash or cat litter disposal bin. The liner can be washed with hot water and soap, which is convenient; then reinsert it into the Modkat Litter Box. Other than that, there is nothing you need to know about using the Modkat Litter Box. If for whatever reason you are not a huge fan of the Modkat Litter Box, there are other options of course. One of these options is the Modkat XL Litter Box. As the name implies, it is designed for larger cats and can hold a larger quantity of litter. It also comes with a reusable liner, just like the other Modkat Litter Box we looked at. The real difference here is that the XL model can be modified for top or front entry, which is convenient. It also comes with a scoop, plus a side door to make cleaning easy. When all is said and done, the Modkat Litter Box does make life a lot easier when you have a cat. For one, it just looks a whole lot better than a normal litter box, which can be downright unappealing. The Modkat Litter Box is great for stopping your cat from making a mess that permeates the entire home. It stops the tracking of cat litter and waste throughout the home, it keeps your floor clean, and it itself is easy to clean as well. If you are tired of cat messes in your home, this is a good thing to have in your arsenal.